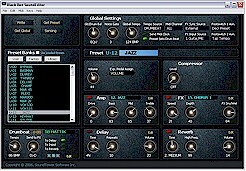 QS-EditPro - Editor/Librarian for the ALESIS® QuadraSynth synthesizers. QuadraSynth QS4+, QS5+ QS6, QS6.1, QS7, QS7.1 QS8, QS8.1, QS7, QS7.2 QS8, QS8.2 and QSR. NanoEditSynth for ALESIS® NanoSynth module. Triton-EditPro - TRITON RACK, PRO, PROX, STUDIO, EXTREME and LE Keyboards. MOSS Board. Karma-EditPro - KARMA Keyboards OS-2 with MOSS Board support. BLACK BOX SOUND EDITOR - M-AUDIO Black Box Guitar Processor. AdrenaLinn II Sound Editor - Mac OSX and PC - Editor/Librarian for Adrenalinn II - Guitar FX/AMP Modeling/Drum Box. AdrenaLinn III Sound Editor -Mac OSX and PC - Editor/Librarian for Adrenalinn II - Guitar FX/AMP Modeling/Drum Box. MIDIJOYS -Tools to control and monitor dynamic Continuous Controllers midi data on PC Midi ports. MIDIJOYS is a FREEWARE program - Don't say we don't give anything for free!